What is the Senior Computer Learning Center? 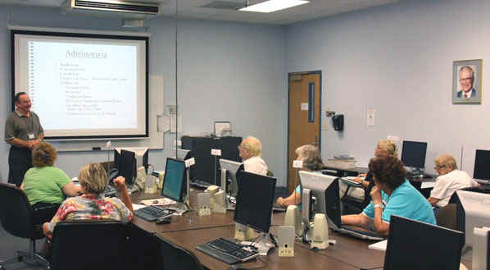 The Senior Computer Learning Center provides a variety of computer courses primarily for adults age 50 and over in a warm and friendly environment. Classes are small and with aid of coaches, students are never left behind. Courses and workshops offered include subjects such as Beginning Computer use, Internet and e-mail, Digital Photography, File Management and many others. The Learning Center is a program for seniors and taught by seniors, in small classes, at a pace and in a language that seniors can understand. All classes are held weekdays at the Kingston Center of SUNY Ulster (KCSU) on Mary's Avenue in Kingston and are two hours once a week for four or eight weeks with workshops just two hours. The classroom is equipped with Windows 7 computers with flat panel monitors to give the students the best learning experience. The instructors and coaches are all volunteer seniors and with many expanding their skills by taking Learning Center courses. Course fees are modest and include the manual and free practice labs.